Welcome to our weekly field guide to 1950s horror and sci-fi movies and the creatures that inhabit them. 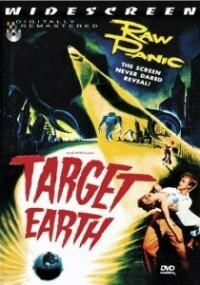 This week: killer robot football players threaten to wipe out humanity in Target Earth. Sense of unease and tension effectively conveyed in first half. Character "revelations" in latter half of the movie are fairly well done. Fades a bit in the backstretch. Not much screen time for alien robot menaces—monster budget apparently allowed for a total of one creature. Drunken sods Vicki and Jim have the right idea: forget about the evacuation, stay home and get sloshed. Better yet, break into somebody's nightclub and get sloshed. Nora and Frank aren't too keen on this, so before long the quartet makes a plan to mosey out of town before something horrible happens. Too late! No sooner do they get started with their moseying than something horrible happens, involving a squeaky-voiced fellow named Charles and a walking Cyclopean robot sporting death-rays launched from its forehead. Told you it was horrible. Meanwhile, the hard-working US military has not been idly wasting time playing Parcheesi and strip poker. No sir! Already various tank units have been deployed in a defensive perimeter south of the city, while the Air Force has courageously sent squadrons of stock footage to wreak havoc against the invaders. Sadly, all of this force has been about as effective as vapor of warm Listerine in repelling the robotic attack. Things are looking pretty grim indeed for our heroes trapped inside the city, and we haven't even gotten to the character development yet. With yet more stock footage bravely hurled against the invading robot(s), the army rushes to study the one prisoner they have in their custody, even as our foursome of civilian stooges—sorry, make that "heroes"—prepare for a night they'll never forget. And by the way, why would anyone think the robots were the only creeps sneaking around the city? After holing up for the evening in a local hotel, our heroes' number is reduced by one—ah, make that two—ah, make that three—even as the movie rockets toward its conclusion. Where the heck is the army when you need them, anyway? What gets scrapped: a couple residents of "the city;" other residents (by report); an unappealing guy; a robot; several squadrons of jets; a crazy dame; a piece of walking slime mold; a tough-talking joe wit' a heart o'gold; a robot. Best lines in the movie: "We're not licked yet. Let's try the back room." Party game: Play "I, Robot" and throw a Tin Can Party. All guests must come dressed as robots. Award prizes for: best costume; most elaborate electronics; cleverest use of silver spray paint; sexiest machine. If you have video equipment, make a short film in which various robots menace human beings. 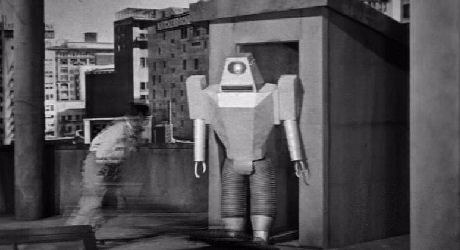 This reminds me of… Robots go on the rampage in such movies as Gog (1954) and Kronos (1957), and provide valuable duty in supporting roles in Devil Girl from Mars (1954) and, of course, The Day the Earth Stood Still (1950). You might think a movie called Robot Monster (1953) would have a monster robot in it, but you'd be wrong—just a gorilla from Mars wearing a diving helmet. Did you notice? Back in the 1950s, people in movies—even the heroes—could smoke and drink constantly! Those were the days, man. Too bad they couldn't share a room. Somehow their careers survived: Besides Creature from the Black Lagoon, released the same year, Richard Denning (Frank) lent his leading-man looks to 1955's The Day the World Ended and The Black Scorpion (1957) among numerous other films. Kathleen Crowley (Nora ) would turn up in 1959's vampire western Curse of the Undead and suspense thriller The Rebel Set. Virginia Grey (Vicki)'s career spanned 40-plus years, beginning with silent epics like Uncle Tom's Cabin (1927) and ending with 1969's Bachelor in Paradise with Bob Hope and Lana Turner. BOTTOM LINE: A tight, engaging little thriller that focuses more on character than special effects.